With our in-house CAD Design & CNC machining facilities, in conjunction with our trusted development partners, we can offer customers a complete service for any potential motorcycle projects. We also are able to make one-off’s or variation’s of our range for specific applications, so contact us for more details. We also stock a range of Rally/Adventure navigation and electronic parts, as well as Continental, Michelin and Pirelli Desert tyres and Mousses. Our Rally/Adventure Kits can be supplied as fully-fitted if required to your bikes at our workshop, at your request, contact for more information. 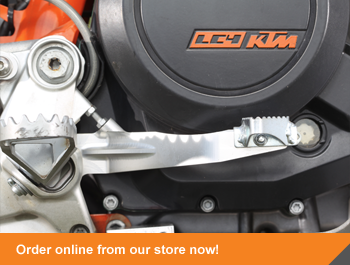 All bikes, including other KTM models, can be prepared to Rally Specification to whatever level the rider requires, including engine preparation and suspension modifications and servicing, wheel re-building and specialist welding (MIG/TIG/Arc & Gas).